The embryonic development times of four planktonic rotifers from Neusiedlersee (Austria) (Rhinoglena fertöensis, Brachionus calyciflorus, Keratella quadrata and Polyarthra dolichoptera) were determined at constant temperatures ranging from 0.6°C to 10.5°C. Development times decreased with increasing temperatures. The curvilinear relationship between temperature and development time was described by Bělehrádek’s equation. 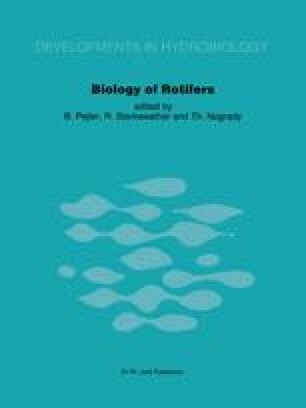 Data on embryonic development times of rotifers are summarized and regression equations for the temperature-duration of development relationship are presented. Adaptation to temperature is discussed in the context of the thermal history of the various species and populations.